While volunteering in rural India 10 years ago with several NGOs, Abhishek Sen, a doctor, saw a large number of people suffering from non-communicable diseases but few ways to diagnose them. “There were several families suffering from serious non-communicable diseases. The male would be hypertensive, the female would be anaemic and the kids would be underweight,” recounts Sen, who along with Yogesh Patil, a classmate from TN Medical College and BYL Nair Charitable Hospital, Mumbai, and a doctor, decided to come up with technology to deal with the problem. The duo founded Biosense Technologies in 2009 to make affordable point-of-care diagnostics to bring quality diagnostics closer to patients. Sen and Patil also decided to concurrently pursue an MTech in biomedical engineering from IIT Bombay and an executive MBA from SJMSOM IIT Bombay respectively. Biosense’s target audience is doctors—both in the private and public sector—from tier II and tier III cities, so making products affordable is key. “The first product we launched was ToucHB, a hand-held needle-free screening device for anaemia. 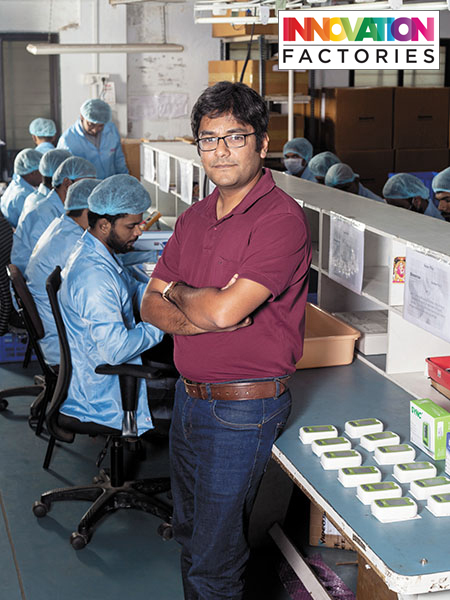 The device weighs less than 300 g and the hemoglobin test result is displayed in about one minute,” says Sen.
After setting up the company, the duo realised soon enough that it could not survive as a single product company, especially since distribution channels were fragmented. They added eight more products including uChek, a semi-automated urine analysis system, that has a smartphone app that processes and monitors urine analysis using conventional dipsticks and SüChek, an affordable glucometer that estimates the value of glucose in your blood accurately. “Our products work in the same way that glucometers work. The blood sample will be collected through a finger prick and the results will be given in 3-4 minutes. Since we are catering to the point-of-care centres, the process needs to be extremely simple since workers there are not very skilled,” says Sen who is working on a device to measure the complete blood count.